Findlay University Jr. Tynelle Gumbs, won the Great Lakes Intercollegiate Athletics Conference Discus Throw on Friday, after placing third in the Hammer Throw on Thursday, with a new personal best and national record performance. Tynelle, who fouled her first attempt, had a second round effort of 48.69m (159’8¾”) to win the competition. Twin sister Trevia was 12th with a mark of 40.03m (131’3¾”). Tynelle was coming off a third place finish in the Hammer Throw with a heave of 59.30m (194’ 6½”), improving her 58.58m (192’2¼”) personal best. She was also fourth in the Javelin Throw, following a 37.92m (124’4¾”) effort. Trevia missed her Shot Put personal best by one centimeter and placed fourth overall with a throw of 14.61m (47’11”). The twins accounted for 26 of Findlay’s 87 points helping their team to a second place finish in conference. Following the meet, Tynelle was awarded the GLIAC Conference Field Athlete of the Meet Award as well as the Field Athlete of the Year Award. Elsewhere, Shaquoy Stevens moved from No. 6 to No. 2 on the BVI All Time List when he won the 100m in 10.36 seconds at the Kansas State Ward Haylett Invitational. 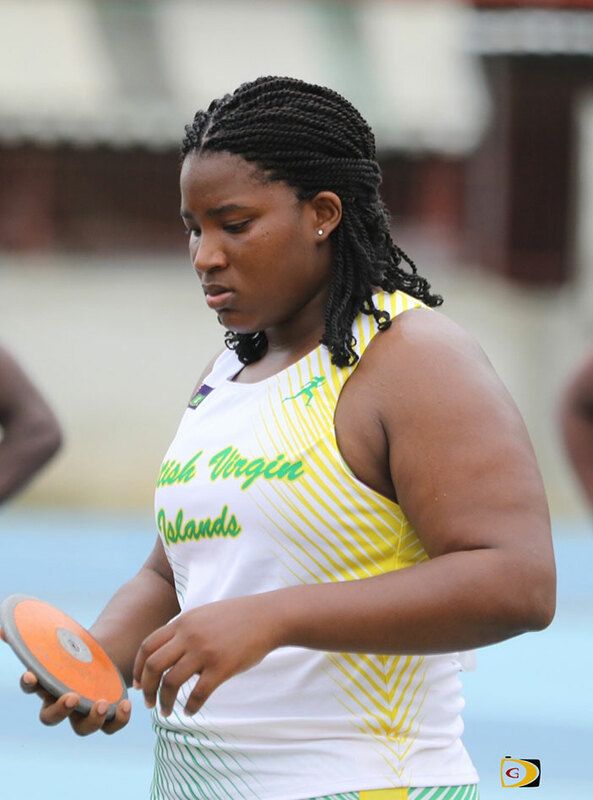 ASA College freshman Kala Penn moved to No 2 on the BVI All Time Triple Jump List, when she cut the sand at 12.73m (41’9¼”), at the Seminole Invitational and placed second. She was third in the Long Jump, after leaping 5.69m (18’ 8”). Teammate Ronique Todman was ninth in the 400m with a time of 48.27 seconds and 19th overall in the 200m after running 23.07 seconds. Competing in the Northern California Jr. College trials, College of the Sequoias freshman Tarika “Tinkerbell” Moses, won her 400m heat in 57.90 seconds and was second in the 200m in 24.57 seconds. Her brother Tarique, a Central Arizona College Freshman, was fourth in the Arizona Colleges Region I 400m, with a time of 49.24 seconds, after a personal best of 48.68 in the prelims. He finished sixth in his 800m heat in 2 minutes 02.91 seconds. Chaz Fahie of Plantation High School, was 10th overall in the Florida 4A Region 4 Championships 800m in 2 minutes 20.35 seconds. He was coming off a personal best of 2:00.82 in the 4A District 13 Championships. At the GRPA Hall of Fame State Track and Field Championships in Georgia, Adaejah Hodge of the BVI, won the 11-12 Girls 100m in 13.40 seconds, was third in the 200m in 27.96 seconds and was second in the High Jump with a leap of 4’5”.